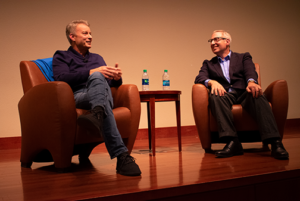 “I realized early on that words are powerful, that words could change, and I thought very early on that I would like to be a writer,” Timothy Egan said when he began his on-stage conversation with Reynolds School professor Alan Deutschman on Tuesday, Nov. 27, 2018. Egan visited the University of Nevada, Reno this week to speak about his life works during the 2018 Robert Laxalt Distinguished Writer Program. He was honored by the Laxalt family, the Reynolds School of Journalism and Nevada Humanities for his career as a National Book Award-winning author and Pulitzer Prize-winning journalist. The Laxalt Distinguished Writers Program was created in 2001 to inspire new generations of writers in honor of Robert Laxalt, who is considered to be one of Nevada’s finest writers. Laxalt also taught at the Reynolds School of Journalism for 18 years. Egan is an author of eight novels, majority being non-fiction. Awarded as a New York Times bestseller for his novel “Immortal Irishman,” Carnegie award winner for his novel “Short Nights of the Shadow Catcher” and the 2006 National Book Award for his novel “The Worst Hard Time,” Egan illuminates history by sharing it in the long form. Aside from being an acclaimed novelist, Egan writes an opinion column for the New York Times. He worked previously for the New York Times as a correspondent for the Pacific Northwest and the West. During his conversation with Deutschman, Egan highlighted his love for writing people’s stories and the social stigmas surrounding current media. He also shared insights into his time as a western correspondent for the New York Times. As western correspondent, Egan noticed that the media “power centers” were located on the East Coast. He used his position to ensure accurate news about the West Coast was shared. Timothy Egan and Professor Alan Deutschman on stage at the University of Nevada, Reno. He also emphasized the importance of history, referencing his novel about the Dust Bowl and the environmental lesson to be learned from that catastrophe. “This is why history is not a dead thing; it informs us… what it tells us is that we already changed the climate,” Egan said. “It is one of the great thrills of my life that I got to sit with a handful of women in their nineties who were the last living witnesses to the catastrophe of the Dust Bowl,” Egan said. 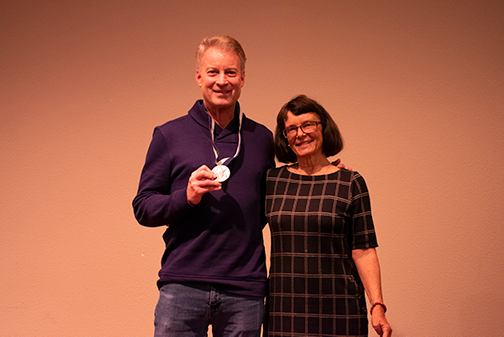 The event concluded with Egan receiving a medal on behalf of the Laxalt family for being named the 2018 Laxalt Distinguished Writer. Laxalt’s daughter Monique Laxalt present the medal. “There are so many points of similarity between you and our father Robert Laxalt… There is just this outwardness about you,” Laxalt said.